Cristiano Ronaldo missed a penalty but Italian league leaders Juventus eased past bottom club Chievo 3-0 to pull nine points clear on top of Serie A on Monday as AC Milan returned to the European Champions League berths with a 2-0 win in Genoa. Portuguese superstar Ronaldo had sealed Juventus' first title of the season - a record eighth Italian Super Cup trophy against AC Milan on Wednesday in Saudi Arabia. "I don't think it's the first time it has happened in his career," said coach Massimiliano Allegri of Ronaldo's miss. "The important thing is that the team won." 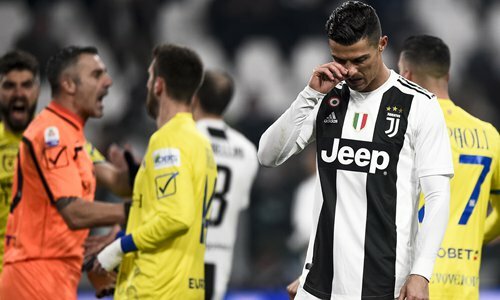 Chievo started their season with a 3-2 defeat to Juventus in Verona during which ­Sorrentino was knocked unconscious after colliding with Ronaldo. But "The Flying Donkeys" - who had been deducted three points for false accounting - ended 2018 with their first win and had lost just one of the previous eight games holding Napoli, Lazio and Inter Milan.